You Are Here: Home » Lifestyle » What Exactly Is A Leap Year And A Leap Second? What Exactly Is A Leap Year And A Leap Second? How many days are in the month of February? The usual answer is 28, but every four years there is a 29th day in February and 366 days in the year. There are also leap seconds added to our days at irregular intervals. These days and seconds keep our calendar running as close to the same each year as possible. They reconcile physical time that we track with atomic clocks and astronomical time, which depends on the rotation of the earth. A leap year is also called a bissextile or intercalary year. It is a year that contains either an extra day or an extra month. The addition of these days keeps our calendar year aligned with the seasonal or astronomical year. It takes the earth approximately 365 and one-fourth days to revolve around the sun, so the addition of an extra day every fourth year keeps our calendar consistent and means that we celebrate each season during the same months each year. If we didn’t make adjustments to our calendar it would be off by about 24 days every 100 years. Leap year began with Julius Caesar in 45 B.C. Until this time the Romans had a 355 day calendar and they would add a day or two to a month every other year to keep their festivals occurring during the same season as the previous year. Caesar made the decision to simplify the calendar. He created the 365 day calendar with his astronomer, Sosigenes. Pope Gregory XIII refined the calendar in 1582 by adding that leap day would occur during every day divisible by four, except century years that are not divisible by 400. This is the same calendar system that we currently use. How Do We Track Leap Year? There are two main types of calendars that people use. The Gregorian calendar is the standard calendar that is used by most people worldwide. This calendar has been used to track time since 1582. The Gregorian calendar is a common solar calendar and one day is added to the end of February every four years in this calendar. The Hebrew, or Jewish, calendar is a lunisolar calendar which adds a 13th month to the year seven times in 19 years. This month is called Adar Aleph and is designed to keep the calendar from cycling through seasons too rapidly. Approximately every one and a half years a single seconds is added to clocks around the world and Universal Coordinated Time. The leap second is added because the earth rotation around it’s own axis is slowing over time. The earth rotates on its axis approximately once every 24 hours, the length of a single day. This second must be added because the atomic clocks that we use to measure time have been ticking away at the same speed for thousands of years, and they will continue to tick at the same speed regardless of the earth’s rotation. How Often Do Leap Seconds Occur? Leap seconds are not added to the clock at regular intervals, but there have been 24 seconds added since 1972. This means that the earth’s rotation around its axis has slowed about 24 seconds during the past 40 years. Most leap seconds are added either the last day of June or the last day of December. The leap second adds an extra second to the last minute of the month. There was just a leap second added on June 30, 2012. While there is not a regular pattern to the insertion of leap seconds, one is added about every 18 months, although there were no leap seconds added between December 1998 and December 2005 because the earth’s rotation accelerated temporarily. Who Decides When to Add Leap Seconds? The earth’s rotation is observed by the International Earth Rotation and Reference System Service. They constantly compare the earth’s rotation and atomic time. A leap second is ordered when the time difference between atomic time and the earth’s rotation approaches 0.9 seconds. There is a debate going on worldwide in regards to leap seconds. There are many people who would like to have the practice of adding one second to UTC abolished because they can interfere with cell phone networks, computer networks, traffic control systems and more. The matter is being decided by international vote, but no changes to the practice of adding leap seconds will occur until at least 2018. The second became the basic unit of time in 1874, but the system of adding leap seconds was not introduced until 1972. This practice was proposed by scientists as a way of reconciling astronomical time, or Universal Time 1 and physical time, or International Atomic Time. UTC seconds are different from leap days because they occur at the same time around the world, regardless of the time differences. Leap seconds were originally ordered by the Bureau International de l’Heure, but they have been added by the IERS since 1988. There are many traditions associated with leap-day around the world. In Ireland and Britain it is traditional for women to propose marriage during leap years. It is considered unlucky for people to get married during a leap year in Greece. Some people who are born on February 29th celebrate their birthdays on the 28th, while others celebrate on March 1st. The legal birthdays of people born on leap day depend on where they live. 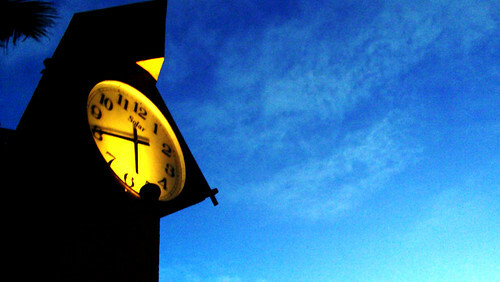 This article was written on behalf of the Online Alarm Clock company at OnlineClock.net. Online Clock offers a wide range of different kinds of web-based stopwatches, timers, countdowns and alarm clocks. All of them can be used directly within your web browser, without the necessity of downloading and installing any software; and all of them are free!